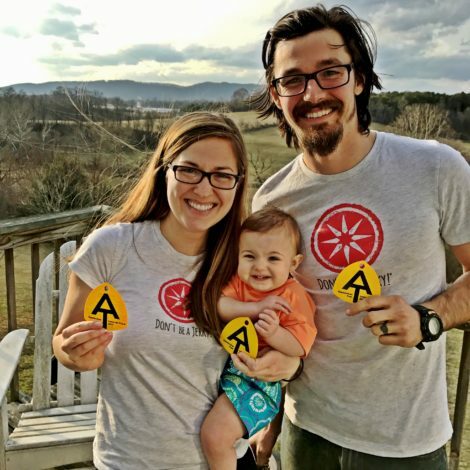 Would you hike the Appalachian Trail with a toddler? Sure, a bit of it. Why not? How about the whole 2,000 miles of it? 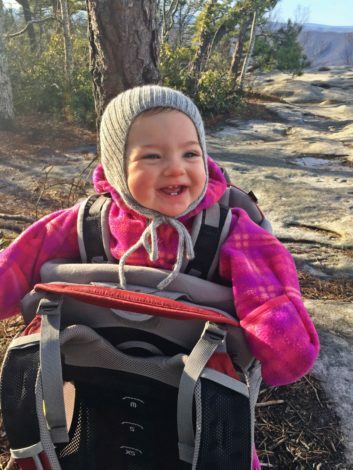 Meet this South Carolina Hike it Baby family that is doing just this. It all started as I was driving to a Hike It Baby trek with my 2-1/2-month-old baby girl, Ellie. It was a 40 minute commute and Ellie was asleep, so I had some time to think. 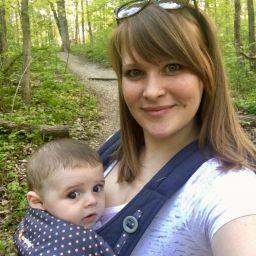 I had left my job as an Outdoor Adventure Guide in Greenville, SC to be a full time mom and I missed outdoor adventuring. This was going to be my fourth time on the trail since she had been born and I craved more and more time outdoors with Ellie. Both of us got cranky when we stayed inside for days on end and I noticed how much happier we both were when we were on the trail. 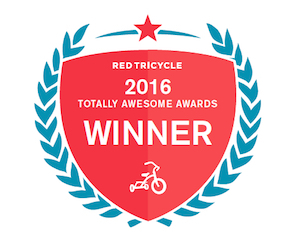 It got my wheels turning…how can we do this more as a family? My husband, Derrick, has aspired to thru hike the Appalachian Trail since he was 15 years old. It ran through his hometown and he would spend his free time exploring the local AT sections. 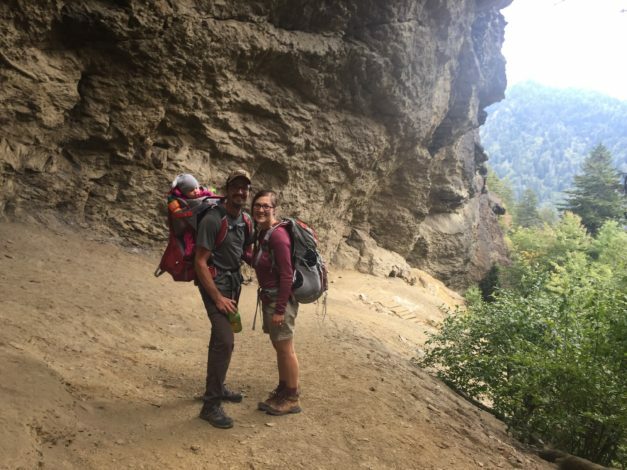 I made a promise to him at our wedding that we would thru-hike together one day. Three years of marriage came and went and we decided it would be a good time to have a baby. Sweet Ellie came along and there was no way we could stand leaving this sweet baby girl for a 6 month hike. Thru hiking the AT could wait until we were empty-nesters. Now here we are, a few conversations later and we’ve sold our house and many possessions, left full time jobs, and registered 3 thru-hikers for a 2017 Appalachian Trail Thru-Hike. Myself, Derrick, and Ellie will head out in 3 weeks and here’s what we’re doing to prepare for taking a 1 year old on the trail for 2,185 miles. While the AT is pretty straight forward, we want to avoid starting with the big surge of thru-hikers in March and April. Therefore we decided to do a flip flop hike starting in Virginia (vs. Georgia) heading south. We’ll take our time averaging 12 miles a day. The AT goes through dozens of towns providing so many food options that the average thru-hiker can get away without a single drop box. The average thru-hiker also doesn’t need diapers! In order to accommodate to Ellie’s diaper and nutritional needs, we are currently packing about 30 boxes of food and supplies for all three of us that will be sent to various hostels and businesses along the trail for us to pick up along the way. These boxes consist of 4-5 days of supplies including home-prepared dinners and breakfasts, snacks and lunches(bars, tuna, jerky, granola, etc. ), disposable/compostable diaper inserts, vitamins, and toothpaste. The boxes will be left open until a week before shipment so anything can be added or changed last minute. 1. Lots and lots of hiking. We took Ellie on a 1-week backpacking trip in the Smokies to test gear and see if our idea was realistic. Ellie did even better than expected! I’m constantly surprised at how well babies do outdoors in any type of weather. Recently we’ve been going on local day hikes up to about 10 miles at a time to get physically prepared and get Ellie accustomed to sitting in the backpack. 2. Why we sold our possessions. A thru-hike is expensive and one of the top reasons hikers have to stop is because they run out of money. We don’t want that to happen! So on top of saving extra cash here and there, we’ve also sold a lot of our things. Including our house. This also minimizes our responsibilities while we’re on the trail. 3. Requesting sponsorships/donations. This has been very time consuming, but well worth the time. We are incredibly thankful for our food sponsors and hopefully gear/clothing sponsors on the way. As of now, we have about 1/4 of our trail food accounted for by sponsors. Thank you all so much. 4. Route planning. This is just a rough layout because I’m sure our route plans will change 562,345 times along the way. But in our circumstances, we need to know exactly where we have our resupply packages sent, how to avoid crowds so Ellie can get a good night’s rest, and how to time our trip with seasonal weather changes. We currently live right by the trail in VA. Over this winter we plan to complete a small amount of the local trail in day trips to get Ellie accustomed to being outside all day long and to test out some gear before we head out for 6 months. This will also help us get some miles under our belt in case we take extra long with Ellie. 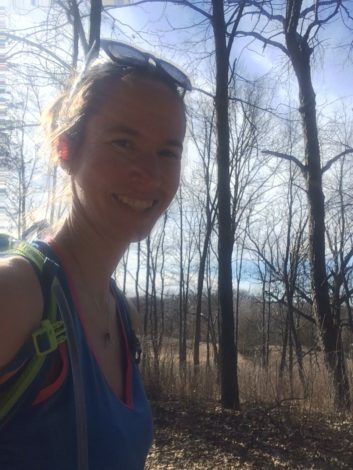 An “official” thru-hike is completing the trail within 1 calendar year. 5. Getting physically ready. I don’t suppose it’s a good idea to be a couch potato all winter then put 45 lbs. on my back and expect to feel amazing. This week I plan to start carrying Ellie in the backpack on my neighborhood walk instead of pushing her in the stroller and slowly add more weight to the pack each week. All 3 of us have been going to the most amazing chiropractor to get our bodies ready! Along with getting physically ready, mental readiness is just as important. I don’t really have any ideas on how to get mentally ready…but birthing Ellie unmedicated is a pretty good test, right? 6. Trial and error. There are still so many things to figure out…cloth diapers or disposable? What kind of dinners should we cook? 2 or 3 sleeping pads? Down or synthetic baby bunting? Is a solar charger necessary? Last week we worked on the diapers…bags of poopy and pee diapers are going to be so fun to carry around. 7. Connecting. Did you know there’s a Facebook group just for those who plan to thru hike the AT next year? And #appalachiantrail2017 is becoming more frequently used. We have been in touch with The Appalachian Trail Conservancy and spoken with other individuals and families who have thru-hiked together. 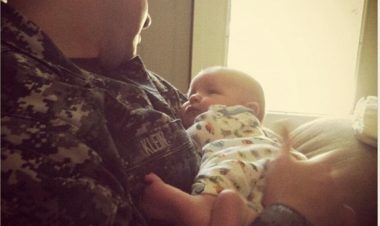 I’d love to find other families who have brought a baby on the entire AT, but no luck there. My hope is to be a resource for other families in the future who desire to take a baby to thru hike the trail. Our hope is that through this trip we can be a resource to other families who dream of extended adventure trips with little ones. You can follow our story on Instagram: @ellieontheat or our blog www.ellieontheat.com. Inspiration hiking with babies, long distance hiking, thru-hiking with babies. permalink. National Nap Day: Hike it out! Where can we follow their story? They will be updating us from the trail (if possible) and will also write a follow-up blog that we will publish. You can also find their story on Facebook! This is so awesome! My husband and I have recently talked about doing the PCT and even the AT. We have a toddler and baby so we won’t be able to do the trail until at least one can walk the whole way. If we can pay our house off in 5-7 years we can rent it out while we hike – it’s our goal to do a trail when it’s paid off. I was inspired to see that a family took a 5 year old on the AT trail and completed it. 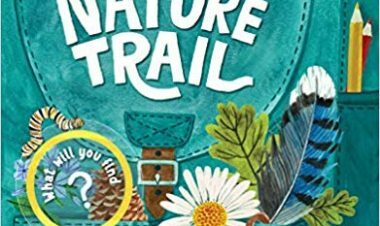 I wouldn’t want to leave my kids at home either, but I’d love to do these trails. I can’t wait to hear more about your adventure! Nothing on their blog since April 2nd, and no response to comments there. Does anyone know if they are actually hiking? My brother is also thru hiking and told me “I saw the baby!” It was in Mahoosuc Notch, the hardest mile of the entire trail. He said she was sleeping soundly on her Dad’s back.